Total War’s official Twitter has released another tease for Warhammer II’s next DLC, ahead of a probable reveal tomorrow. Said tease is a letter, which hints strongly that the next content drop will be all about pirates, possibly of the undead variety. The letter is addressed to an unnamed admiral, and recommends its recipient “set sail” for “the wharf of the Rusting Harbour.” The Rusting Harbour is in Sartosa, the pirate capital of the Warhammer world. Sartosa was recently added to Warhammer II’s Mortal Empires campaign – taken by many fans as a sign that it would feature in the next DLC. We know about the Rusting Harbour from the lore around Dreadfleet, a spin-off Warhammer tabletop game all about maritime battles. The titular Dreadfleet was led by an undead admiral named Count Noctilus and opposed by a pirate captain named Jaego Roth, each of whom assembled an alliance of other captains drawn from across the Warhammer world. Undead pirates have another precedent in the form of Luthor Harkon, who founded an undead enclave, the Vampire Coast, on the shores of Lustria. While trying to sack a temple there, protective glyphs written by the Lizardmen attacked his mind, rendering him insane. 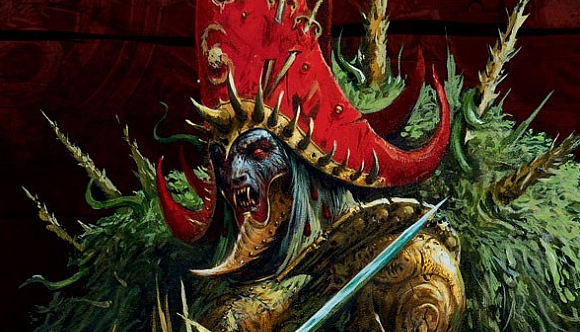 The line in today’s letter referring to ‘shattered minds’ could well be a hint that Harkon is coming – like Sartosa, the Vampire Coast is a faction in the game right now, and ripe for a little fleshing out. It’s also notable that Total War: Warhammer’s lead narrative designer, Andy Hall, was once on Games Workshop’s specialist games team, and had a hand in the design of Dreadfleet. I have no idea what that might actually mean, but it’s definitely notable. How does this square with previous teases? Pretty neatly, actually. If the smudges on the map tweeted out last week correspond not with the continents on the Vortex map, but with the landmasses around Sartosa, then the ‘X’ marks Sartosa perfectly. And as many fans noted, the development update mentioning “salt” could easily have been nodding to its use as nautical slang. One more thing. Total War: Warhammer doesn’t currently have a naval battle system – it’s one of the reasons a mod that jerry-rigs such a system is one of the more popular on the Steam workshop right now. Can Creative Assembly really introduce a seafaring expansion without putting ‘proper’ naval battles in?